If you take a walk in the coffee plantation in May or June, you will find that the coffee beans are gathering closely in their green leave stalks. The beans grow one next to another; they are so numerous that they bend the small branches of the tree. Young beans are green, and look like jade or pearls; ripen ones are red and bright, and look like red rubies. As a drink, coffee is quite popular in all over the world. It ranks number one among the three most important drinks (coffee, tea, and coco); and plantations of coffee also distribute in over 76 countries of the world. In the year 1983-1984, the world coffee output totaled to 5.5 million tons, and coffee export amounted to 4.2 million tons. Of all the countries in the world, Brazil of South America produces the most coffee, and the country also enjoys the title of �the kingdom of coffee�. Nevertheless, coffee does not originate from Brazil, but Aesopian, an African country. Up to the present, in the dense forests in the southwestern province, �Cafa�, Ethiopia, there are still large pieces of wild coffee plants; and the name coffee just comes from the name �Cafa�. There are a lot of stories about the discovery of coffee. One story goes: there was a prince in Ethiopia in the 13th century. He found that his camels liked eating a kind of small berry growing on a short plant, and they would become quite excited after having them. Therefore, he went to collect some berries, had a taste, and as a result found the refreshing drink of coffee. The second story goes like this: one day in 500 B.C., a shepherd of Ethiopia took his sheep to a strange land. On the hill slopes, the sheep had some red berries growing in a kind of short plant. After coming back in the evening, all of his sheep acted out of normal behavior. They were no longer docile and calm as usual; they became quite excited and continued bleating; some of the sheep even jumped around the whole night. The shepherd thought that his sheep might have got poisoned by some food; however, after examining his sheep carefully under the light, he found that they were all in high spirits and did not look like ill. On the second day, when the shepherd opened the fence, the sheep swarmed to the hill slope where they had the red berries. It did not work whatever the shepherd did. When the shepherd found he could not stop them, he followed the sheep to the hill slope in exhaust. He found that all sheep were striving for the red berries. He felt quite strange and also collected some. He chewed the red berries and found that they were a bit bitter. After going back to his camp, the shepherd found that he was in high spirits again, and what is more, he was too excited to fall asleep. The miraculous effect of the small berries became known to everybody soon. The shepherds in all over Ethiopia walked around in an attempt to collect some of such small and red fruits, and sold them on the market. Afterwards, the small red fruits evolved into the most popular coffee drink of the world. As a matter of fact, the Arabs began to grow coffee as early as in 525 B.C.. Afterwards, chewing coffee beans became quite popular in the Arab districts. In 890 A.D., the Arab merchants sold their coffee beans to Yemen, and the Yemen people made coffee into a drink for the first time. In the 15th century, coffee spread to Europe, Asia and very quickly America. By the time of the 18th century, coffee was widely planted in tropical and sub-tropical areas of all over the world, and became one of the three major drinks of the world. The annual coffee sales volume ranks number one among these three, which is three times of that of coco, and four times of that of tea. Though the history of coffee plantation is as long as more than 2000 years, its history for planting in China is only several hundred years. In 1884, coffee was introduced into Taiwan for the first time. In the early 20th century, some overseas Chinese brought coffee to Hainan Island and began to grow them there. Later on, the provinces in the tropical and sub-tropical areas of China began to plant coffee one after another. Though the history of coffee planting in China is short, the quality of coffee planted in Hainan and Yunnan province of China is superb, which enjoys very good reputations on the world market for its special charm. Many foreign merchants came to China to purchase coffee in Hainan and Yunnan at very low prices, after simple processing, they would sell the finished product on the world market at much higher prices as first-class drink. The coffee of the best quality in China is the small bean coffee planted in Yunnan. Because the temperature here varies greatly between day and night, it is beneficial for nutritious substances to accumulate in the beans. The coffee planted there is not bitter in taste, instead, it gives off a fragrant smell and has high oil contents; therefore, it is praised as �the best coffee of the world�. 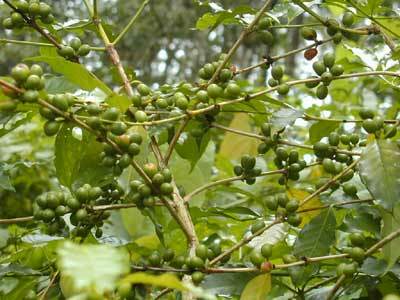 Coffee is an evergreen small arbor as well as a kind of horticultural and economic crop. It grows quickly, has high yield, contains high value contents, and is on sale everywhere. The varieties of coffee are divided into small bean, middle bean and big bean coffees. The first has low caffeine content and a strong fragrance; the latter two, because of high caffeine contents, are not so fragrant. The coffee sold on the world market is generally a mixture of small beans and middle beans according to different proportions; generally the proportion is 70% middle beans and 30% small beans; and the function of the small beans is to add fragrance to the mixed products. Each coffee variety generally has several or about a dozen variants. Coffee plants like shade and are cold resistant, but they are not resistant to sunlight, draught and illness. Coffee contains caffeine, protein, coarse fat, coarse fiber and sugar etc. As a kind of drink, it is not only fragrant and tasty; it also has the function of cheering up spirits and driving out fatigue. In medical treatment, caffeine can be used as narcotic, uretica, excitant, and cardiotonic etc. to assist digestion and to promote metabolism. The fruits of coffee are rich in sugar contents, and can be used to make sugar or to distill alcohol. The coffee flower is rich in essential oil, so it can be used to detract high-rank perfumes.